The Friends of Hackney Archives AGM will be held on 7th September 2016, followed by a talk on Hackney’s Cinemas by Robert Rider. Robert Rider is Head of Cinema at the Barbican Centre and is a Londoner by birth. Growing up in Paddington, he studied at Leeds and Essex University, acquiring an MA in Sociology and a PhD in Social History. Subsequently he worked as a photography teacher in the East End and was a founding member of the Camden Photography Co-op. Whilst trying to make ends meet whilst writing his thesis, he worked as an usher at the Gate Cinema in Notting Hill, and subsequently became manager of a new Gate cinema in Camden Town (now the Camden Town Odeon). 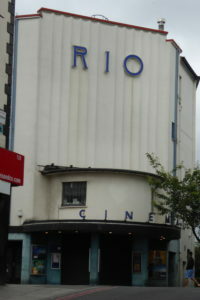 This was followed by a seven year period as Film Programmer at the Rio Cinema in Hackney, after which he joined independent film distributor Electric Pictures. In 1992 he left Electric Pictures and joined the Barbican. He is responsible for creating and delivering the Barbican’s cinema programme that combines films on general release, alongside a variety of festivals, seasons, screen-talks and special events. At the Barbican he has placed a special emphasis on silent film accompanied with live music, children’s programming, and world cinema. Major recent projects have included: ‘Urban Wandering – Film and the London Landscape (2013), City Visions – Cinema and the Modern City’ (2014) and ‘The Colour of Money – From the Gold Rush to the Credit Crunch’ (2015). He is currently working on ‘What London Watches – Ten Films that Shook Our World’ – an audience participation project which is possibly the first major international film season to be curated by audiences rather than professional programmers.